It's not Rocket Science, it doesn't have to be. It's a simple classic. Mix all the ingredients together and then add, without cooking, to brighten soups, stews, braised meats, pastas, fish and seafood. Since in California local lemons are available all year round, gremolata will be a great way to add a little sunshine to the plate as we head toward Winter. According to my unexacting research on the interweb, Gremolata, meaning ground or chopped, first made its mark on the world as the Italian-born accompaniment to Milanese Osso Bucco. However when fact-checking in the Silver Spoon, the Italian household cookery bible, their gremolata recipe doesn't actually contain any garlic. 2004 | Pate a Choux "Potatoes"
Thanks for mentioning me. This recipe is now one of our favorites. you can also add rosemary to the gremolada. while pairing with lamb, especially..and anchovies too. Sounds like a very tasty accompaniment for soups. Thanks for mentioning my osso buco post, Sam! I haven't got The Silver Spoon, but my other Italian cookbooks did include garlic in gremolata. Go figure!? Looking forward to your soup recipe. 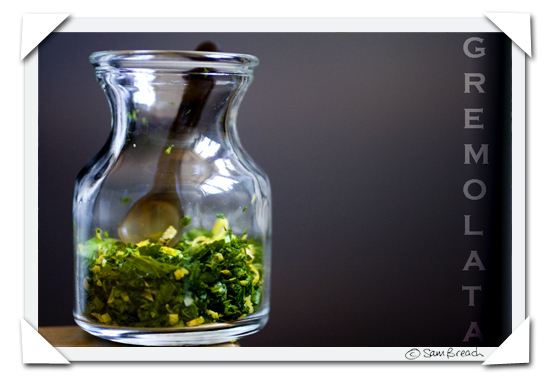 Interesting - I've never even heard of gremolata, so thank you for the education! Yours looks great. I do mine with a mortar and pestle. I really enjoy the making of it in this way and will also add a bit of this and that. Thanks for the post. Thanks for the mention Sam. As far as we can tell there are no hard & fast rules for Gremolata. I often use orange and lemon zest together because thats what was in the Italian recipe I use for a osso bucco dish. Thanks so much for mentioning my stuffed zucchini, Sam! Gremolata's one of my favorites, and I'm looking forward to hearing about your soup. How do you go about storing the gremolata? Can you make a big huge batch and keep it in a jar? I am positively champing at the bit for mussel season to arrive down here in OZ. Mussels Gremolata, with some fresh pasta dura from the wood fired oven. You canna get closer to Heaven than that!! You are teaching your old mum a thing or two~ I know not difficult I hear you say!! This may very well be the a classic accessory like a strand of pearls for one's wardrobe! sounds like it can dress up any dish, will give it a try. Sam, your blog just gets better and better and better. Especially the photography and your graphic use of attractive fonts. It's such a pleasure to visit.